The USA version of this KVM Extender is the Minicom 0DT23009A and is still available. The Minicom SUN Mini KVM 0DT23009 Extender is a high value, affordable solution for extending your KVM console from your computer or KVM switch to a distance of up to 70m/230ft away over clutter free CAT5/6/7 cables. For industrial applications such as manufacturing lines or clean rooms, the Mini KVM Extender provides maximum safety and security allowing you to place computers and servers in a single centralized location, far away from any production hazards. IT managers seeking extended access to server rooms in a tightly secured environment will find the Mini KVM Extender particularly efficient and easy to use. Ideal also for presentation and training applications, the Mini KVM Extender provides flexibility and security coupled with highly attractive pricing. 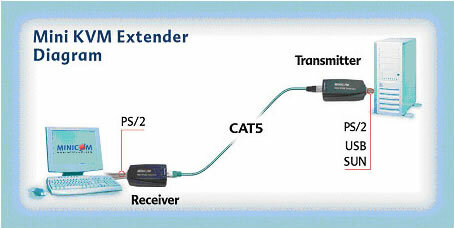 The Minicom Mini KVM Extender is made up of 2 micro sized, compact units on both ends: the Transmitter unit that connects to the computer and the Receiver unit that connects to the KVM hardware. The Mini KVM Extender is a pure hardware solution making it both software and network independent. Micro sized - Smallest form factor for sleek Transmitter and Receiver units. Once installed you won't even know they exist!